The classic eton mess, but in ice cream form! 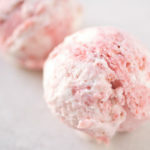 A simple cream-based ice cream mix, with pureed strawberries and crushed meringue mixed-in. Combine the sugar and the strawberries in a small bowl. Cover and leave to macerate in the fridge for approximately 30 minutes. Remove the strawberries from their maceration juice and puree them using a handheld blender. Pour the double cream, the sugar and the milk into a pan. Split the vanilla pod down its length using a knife. Use the dull side of the knife to scrape the vanilla seeds from the pod. Place the vanilla seeds in the pan, together with the now empty vanilla pod. Bring to a simmer, then remove from the hob and let infuse for 30 min. Even better would be to let infuse in the fridge overnight if you can. Place the mix in the ice cream maker and start churning. The crushed meringue and strawberries will be added towards the end of the churning, so the mix should not be completely frozen and instead have the consistency of a soft serve. In my ice cream maker, this takes about 50 minutes. After 50 minutes, gently pour in the strawberry puree and continue to churn before adding the crushed meringue. Depending on the size of your ice cream maker bowl, you may need to fold the meringue in with a spoon to make sure it all fits before churning for the final 5 minutes. Pour into a tub and and freeze until needed. Freeze for minimum 2h before serving. Because of the meringue, the ice cream will need less time to become soft again when pulling out from the freezer.